Now, how do you prepare a holiday to Iceland? Maps? Flight tickets? Travel guides? "Hallo Dave! I would like to build a bicycle!" "Well done, it's getting time for this...."
"As I am not entirely normal, I would like to build a FOLDABLE TANDEM"
It took an other week or so for some small parts (fork, rack...) and a professional paint job (thank you Dave). Then came the big day! 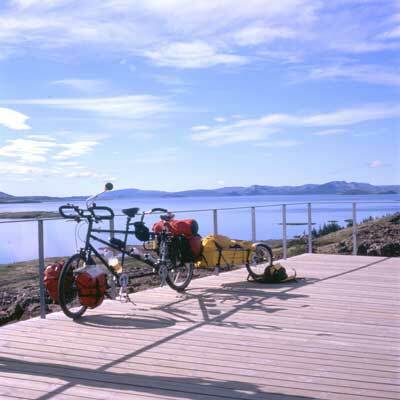 The bike was assembled, only 5 days to go before we would fly to Iceland. Would the bike go in a straight line? Would it be strong enough for the Icelandic roads? Well, it goes in a straight line, in fact you have to push it a bit in corners, but this I think, is because the bike is about 15cm longer than my old Santana tandem. 100km we went in the UK for testing, then it was folded (S&S couplings), packed, shoved in a car boot, abused by Icelandair luggage handlers and there we were Iceland! 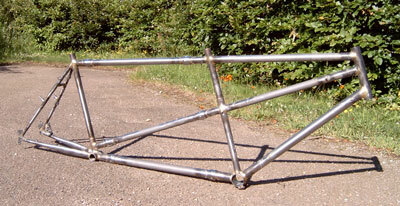 For the interested: S&S couplings make your bike foldable. They cost a fortune but are well worth it. My tandem has 6 of it. Want to computer design your tandem on the internet?